CP: What originally brought you to the Folk School? 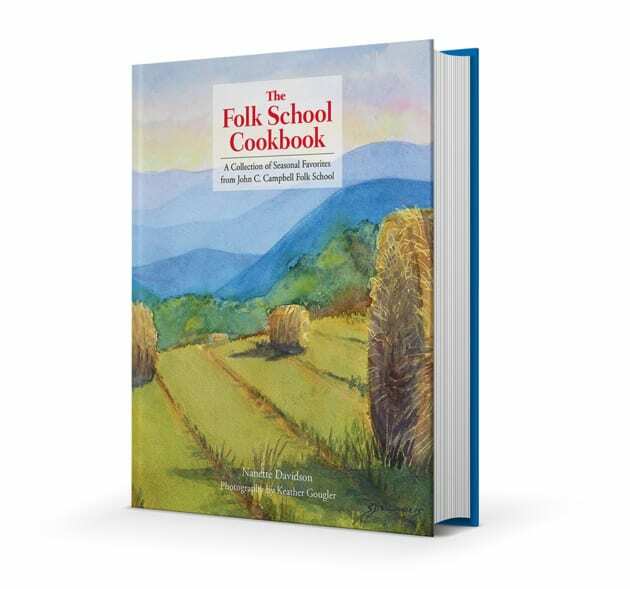 TC: Like so many of us, I found out about the Folk School by happening upon a catalog, and I was amazed that you could study so many different things at one place! At the time, I was a graduate student at ETSU and I immediately decided to take a break from my studies and apply for the Host position. The rest (as they say) is history. CP: What’s it like returning to the Folk School as a full-time employee? 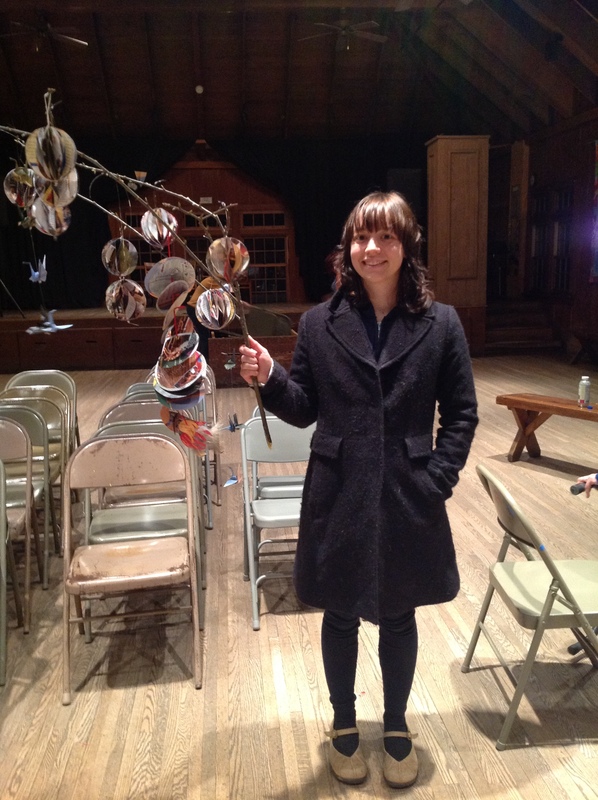 TC: It has been wonderful reconnecting with the greater Folk School community! Though I have been teaching in Virginia, it feels, in many ways, as though I never left. One of the magical qualities of the Folk School is that you always feel at home here. 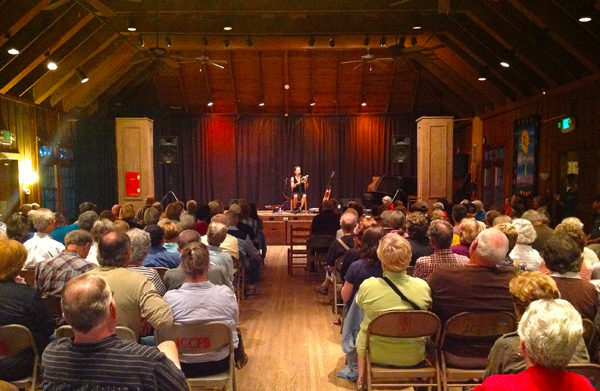 CP: What are the strengths of the music and dance program at the Folk School? What are you excited to bring to the table? TC: The Folk School is unique in regard to the amount of programing offered in music and dance. There are weekly opportunities for folks to study a wide variety of musical instruments and dance styles. There are also opportunities for the larger community to attend live concerts and participate in weekly dances at the Keith house. There is always something being offered! I have a deep love for traditional music and dance. During the last few years my social life revolved around playing music at weekly jams and going to dances around the Shenandoah Valley in Virginia. I also enjoy running sound and coordinating events. 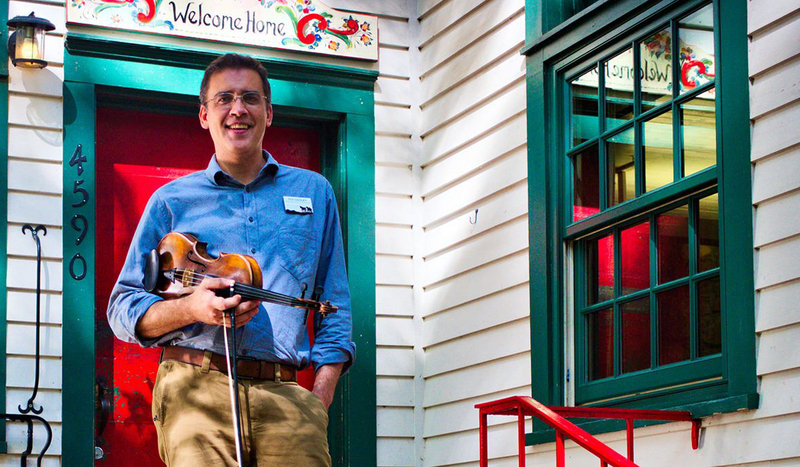 One of the advantages that I have in my new role is that I have been working for the Folk School for many years. I have been a host twice, been a Resident Artist and Recreation Leader for our youth programs. I not only have met a lot of artists connected with the School, but these opportunities have also given me a unique perspective that I feel will be helpful during my tenure here! CP: When did you start to play music? TC: I was born into a musical family and was heavily influenced by singing in choir at church. My mother is a talented pianist and my grandmother was also an active musician. So, I essentially grew up singing and playing. By the time I was in college, I had started to play multiple instruments. CP: What are your favorite instruments or styles of music? 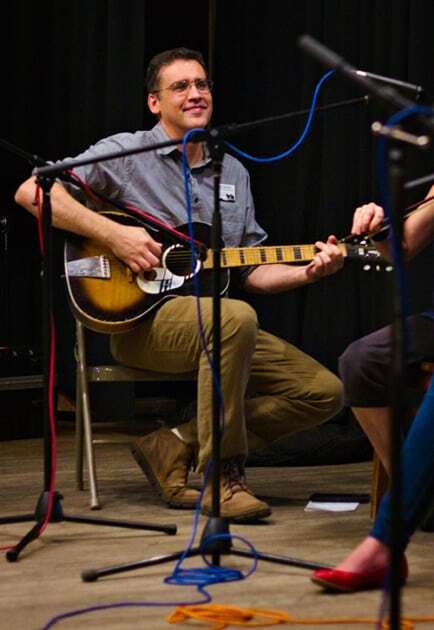 TC: I love to sing, of course, and enjoy playing many instruments. 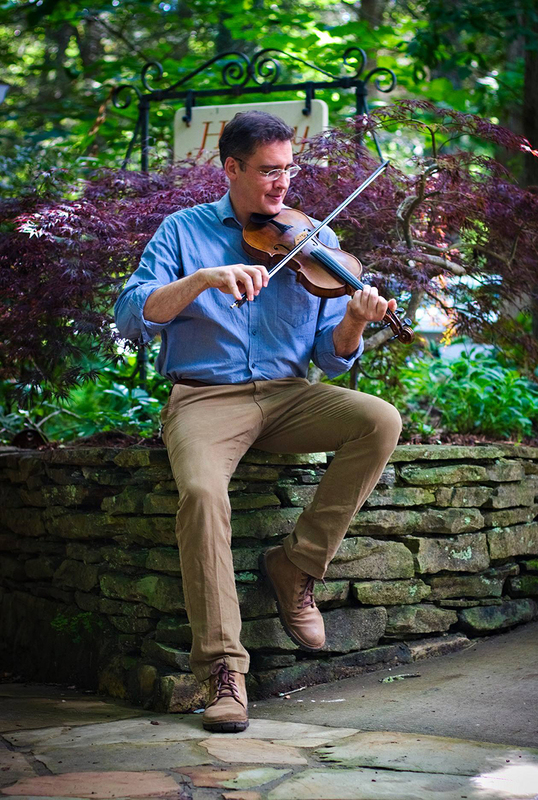 I jokingly say that I play anything with “strangs.” The fiddle is definitely one of my favorites. It takes more effort than most other instruments I play, but I seem to gravitate to it more these days. I appreciate many genres of music, but I would say that playing old-time fiddle tunes and the country blues are among my favorites. TC: Kindness always inspires me. That is one of the things I so value here at the Folk School. The feeling around campus is one of support. Whether it is in the classroom or on the dance floor, there is always someone who will encourage you and make you feel welcomed. I appreciate that our name tags put us on a first name basis with so many new friends. CP: If you could collaborate with a musician living or dead, who would it be? TC: Mike Seeger of the New Lost City Ramblers has always been one of my heroes! I wish he was still around, but he did leave an incredible legacy. I had the privilege to meet him on several occasions. I even got to dance with him at the Greenwood dances years ago. CP: Since many of the music classes are geared toward beginners, what is your advice to beginning musicians? TC: Be patient with yourself. It takes time to apply all of those new chords shapes, scales and finger positions you are learning. Find opportunities to play with others when you get home. That will make you a better musician and help you to feel more comfortable with your instrument. Lastly, I would say get a stand for your instrument, rather than keeping in a case, so it will be more easily accessible to you. CP: What do you know now that you wish you would have known when you were getting started? TC: Practice is so important, it is the only way to improve your ability, but sometimes you need to just play! Don’t forget to have fun. And, while you are practicing, slow down and be careful to not “practice” your mistakes. Ted plays guitar for one of the dances in the Community Room. CP: What’s your experience with contra and community dances? My first experience in the dance world was participating in the square dances that my friend Jim Lloyd would play for in Rural Retreat, VA. Since then, playing for dances has been one of my most favorite things to do! In the past few years, I have been a regular at dances in the Shenandoah Valley in Virginia. CP: What is your favorite contra/square dance move? TC: That is a hard one, I would say Petronellas. CP: Do you have any interest in calling dances? TC: Absolutely! I am really excited to have an opportunity to call dances. I have only called a few dances so far, but I am excited about the challenge! My hope is to start calling one or two during our Tuesday Night Dances. CP: Are you involved with the Morris dance/clogging teams? TC: I have played for the Brasstown teams in the past and have also danced with the Men’s Albemarle Morris team in Charlottesville, Va. I hope to once again play for our local teams this fall. Ted teaches a storytelling class. CP: Besides music, dance, and storytelling, what are other crafts you like to do? TC: I love sculpture, woodworking, pottery, printmaking and painting. I have been so blessed to have taken multiple classes here at the Folk School. These have formed so many aspects of my life and career. 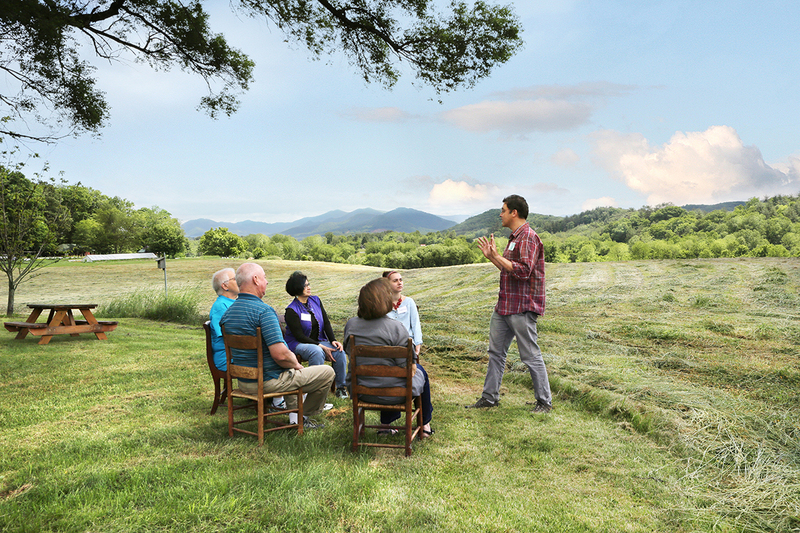 CP: What is a favorite class you have taken at the Folk School? TC: I really have enjoyed our instrument building/lutherie classes. I have built dulcimers, resonator guitars, a banjo and several other folk instruments over the years. There is nothing quite like playing an instrument that you built yourself! TC: That is another hard question. If I narrowed it down, I would say that my two favorite places are the Community Room and anywhere on the Rivercane Trail. I love the acoustics in the Community Room and I get to see Redwing blackbirds on the edge of the Rivercane Trail! TC: I feel so honored to serve as the new Music & Dance Coordinator. It is a real privilege to be here and I am ready to continue the great legacy that music and dance has brought to the school. I am really looking forward to the journey ahead. Questions? Or are you interested on being on our dance/music email list? This list is solely dedicated to music and dance events. Send Ted an email. PreviousThank You for a Wonderful Gala & Benefit Auction! I’m hoping to make the shape note gathering this Sat. I’m currently in WY but headed home – and unfortunately I do not have a song book. Any suggestions on where I might find/borrow one? Thx. We will have books for folks to borrow at the gathering. I just returned from my first Little/Middle escorting my grandchildren to camp. It was also my premiere experience on the John C Campbell campus. I will return I’m sure!! I can understand your comment that it “felt like home” because, despite it being my first experience at the school I felt like I was at a family reunion and I was the new “in law”! My granddaughters and I really enjoyed the dances during our stay. I live in Ashe County, NC (“the coolest corner of NC”), we’re not far from Boone. 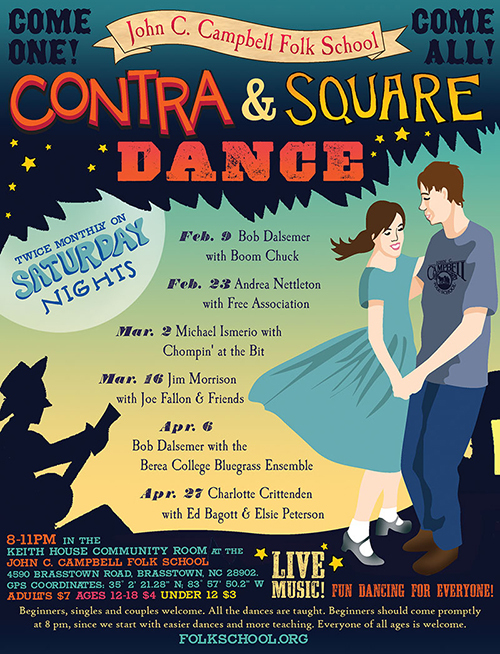 Do you know of any Contra dance callers in this area? 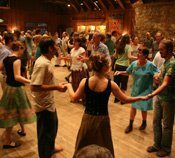 I am planning a Family Fun night at a barn venue in West Jefferson in September and would love to explore the possibility of having a Contra Dance to bring the generations together. Any suggestions you could give me would be greatly appreciated. Congratulations on your new position at JCCFS. I know there are big plans on the horizon there.